The Jewish holiday of Purim will be upon us in a few weeks, and I’m in that creative zone thinking about what to prepare. Purim is a very lighthearted holiday. You can learn more about it here. One of the foods that we traditionally eat on Purim are hamentashen. They are usually triangular filled cookies made to represent the evil Haman from the holiday story. I’ve been making these little cookies since I was a kid, but in the past few years, I’ve been trying to balance the savory and the sweet when making my hamentashen for the Jewish Holiday of Purim. This year was no different. I’ve been brainstorming various flavors this year and hope to share a few of them with you over the next several days. This hamentashen came about because I’ve been wanting to make traditional Korean Mandu for a while now. 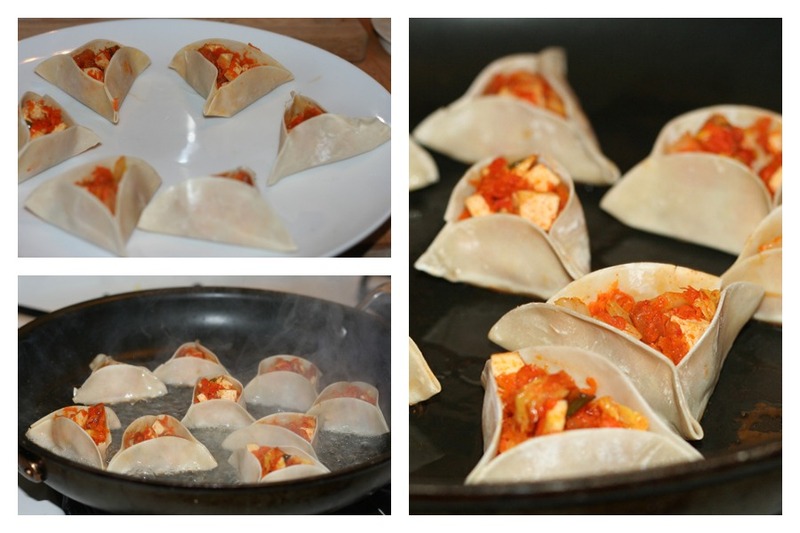 I’m also a huge fan of Kimchi – and from that, kimchi dumplings, of course. It dawned on me last week, that I could possibly turn it in to a hamentashen of sorts. Both are always filled and shaped. Why not? 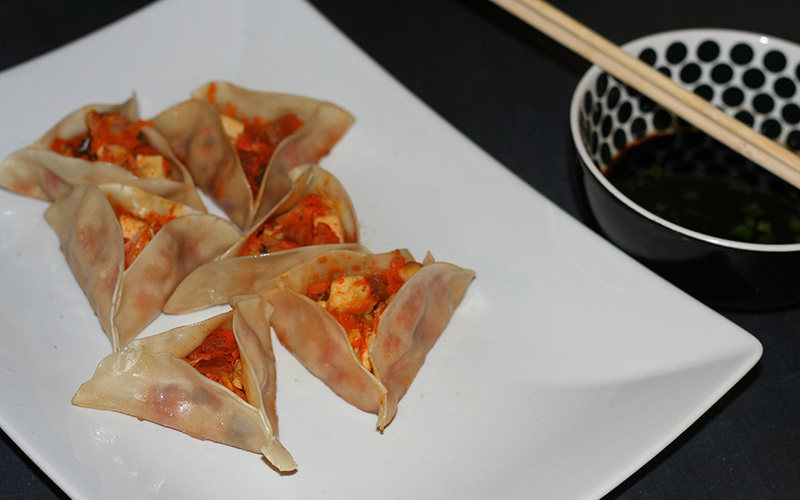 I made some vegan daikon kimchi a few weeks ago, so these dumplings came together quickly. I decided to cook them potsticker style so that I could keep the hamentashen dumplings up right, so that it looked like a traditional hamentashen where you can see the filling. I started by quickly stir-frying some tofu with ginger and garlic. Next, I added in some grated carrots, scallions and Napa cabbage. Once that mixture had softened, I added some of my special radish kimchi. I added enough that it was would contribute a lot of flavor to the mix, but I didn’t want the kimchi to overpower or overheat the dumpling. The smell coming off of the pan is amazing! I seasoned with a small amount of salt – about a teaspoons. When the filling mixture was done cooking, I transferred it to a bowl and let it cool. I placed a tablespoon of the filling in the dumpling wrappers and then pinched the round dough to form corners, like I’ve done in the past with my hamentashen cookies. I dabbed the corners with a bit of water mixed with corn starch. It helps glue the corners in a bit. Once I prepared several dumplings, I heated my pan with vegetable and sesame oils. I placed the dumplings in the pan and let them brown a bit. Once they were browned, I added some water to the pan and covered the pan to let them steam. I removed the lid when the water had evaporated. Oh my. Now this is a hamentashen to enjoy and be proud of! 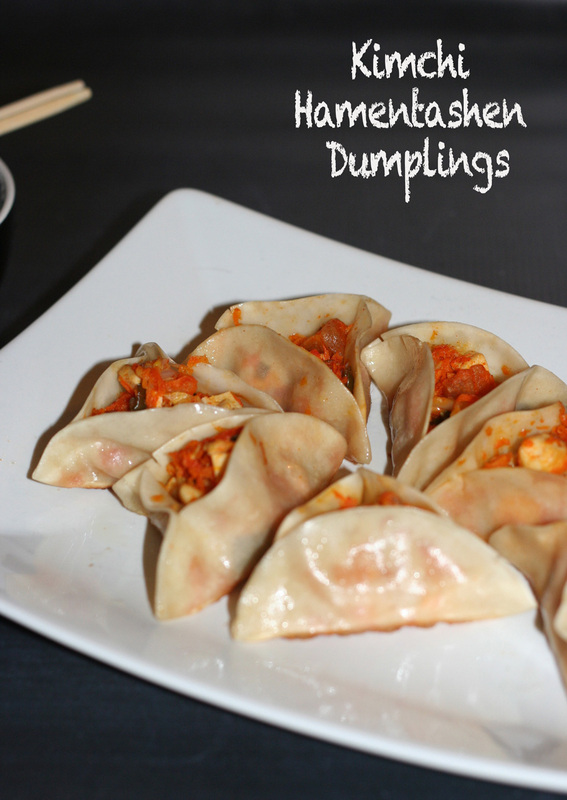 Definitely making these dumplings and these hamentashen again. Heat up the 2 teaspoons of vegetable oil along with the 2 teaspoons of the sesame oil. 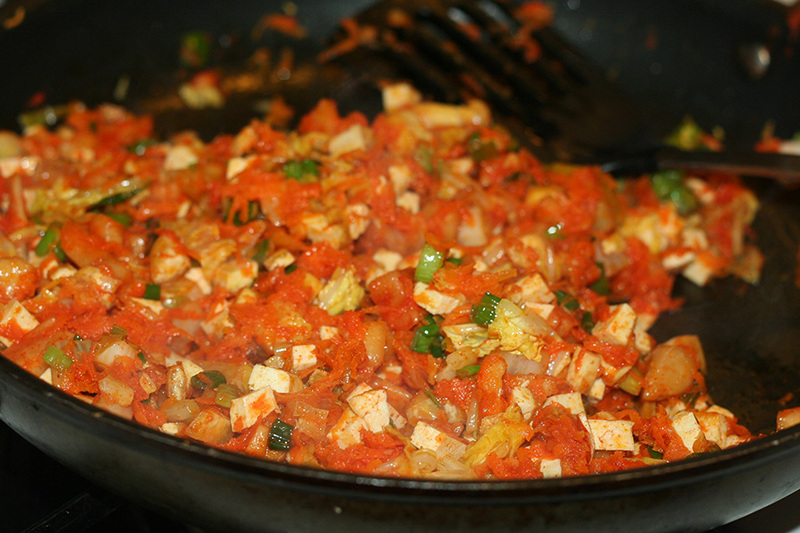 Add in the tofu and cook for several minutes. Once the tofu is cooked a bit, add in the garlic and ginger. Let the garlic and ginger get fragrant, then add in the carrots, cabbage and scallions. Let them soften a bit. Next, add in the chopped kimchi. Stir everything together. 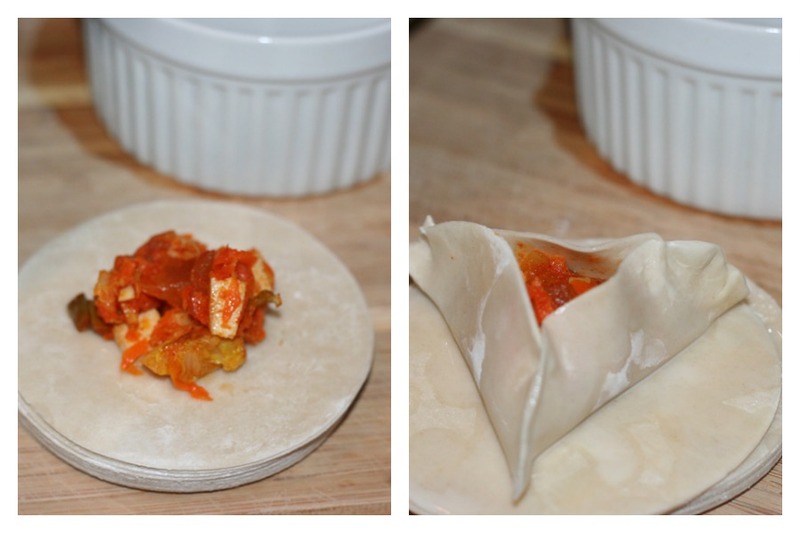 Place a tablespoon of dumpling filling on the dumpling wrapper. Pinch in the corners and seal with the corn starch and water mixture. Heat the oils in a large pan that has a fitting lid. Place the dumplings bottom down in the pan and let them brown a bit. Should take a couple of minutes. Once the dumplings have lightly browned on the bottom, pour about ⅔ cup of water in the bottom of the pan and cover pan with a lid to steam the dumplings. Let the dumplings steams until the water has evaporated completely. Transfer to a platter. Repeat with any additional dumplings. Dip the dumplings in a mixture of tamari, sesame oil, rice vinegar and scallions. I love Chex Mix. 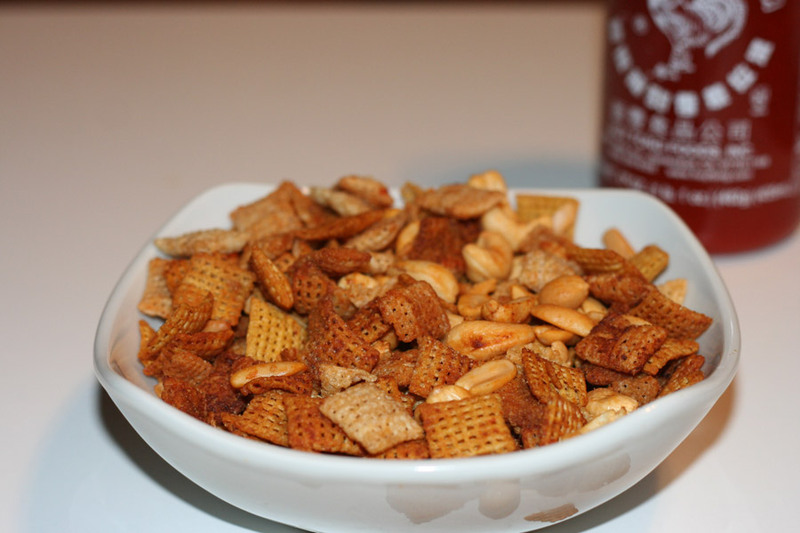 Chex Mix is one of my favorite snacks. Only homemade Chex Mix though. I stock up on Chex Cereals whenever I see them on sale at the grocery store. I’m always trying to come up with new flavor options for the wonderful snack mix. 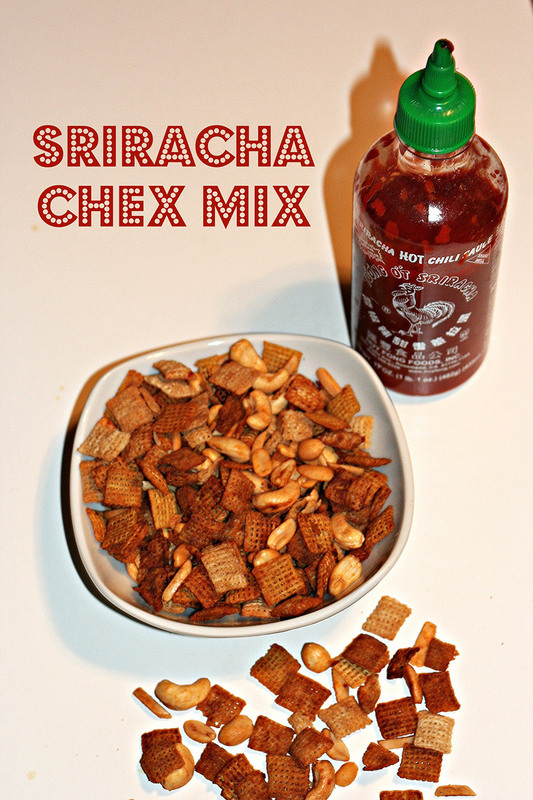 I’ve made it with Creole seasoning, I loved it with curry seasoning and just recently, I decided I needed to make a Sriracha Chex Mix. Who doesn’t like sriracha? It seemed like it would be the perfect addition to this snack mix. I was right. In a giant mixing bowl, I mixed up the Rice Chex, Corn Chex, cashews, almonds and peanuts. I mixed up some melted butter, sriracha, sesame oil, and tamari. I processed some garlic and ginger in my Cuisinart Mini-Prep so it became a paste and then added it to the bowl with the butter and the sriracha. I poured the mixture over the Chex and nut mixture. I stirred everything well. I placed everything on a rimmed baking sheet and then I baked it in the oven at a low heat for an hour. I stirred it up every 15 minutes or so. I then let the mixture cool and then sampled a bit. Oh yeah. This Chex Mix came with us to our New Year’s Eve party. It’s perfect for any party or just for casual snacking. I love the kick of the sriracha! In a large mixing bowl, combine the dry cereals and the nuts. In a smaller bowl, combine the melted butter, tamari, sriracha and the sesame oil. 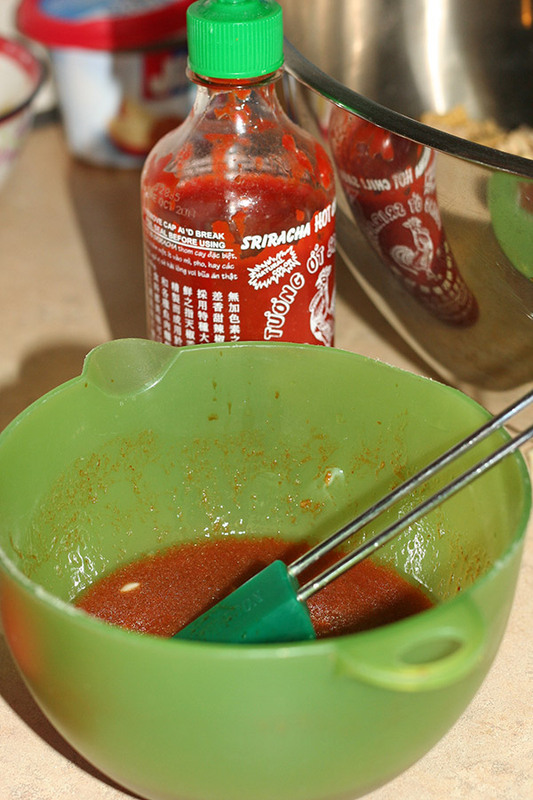 Puree the garlic and ginger in a food processor and then mix in to the sriracha mixture. 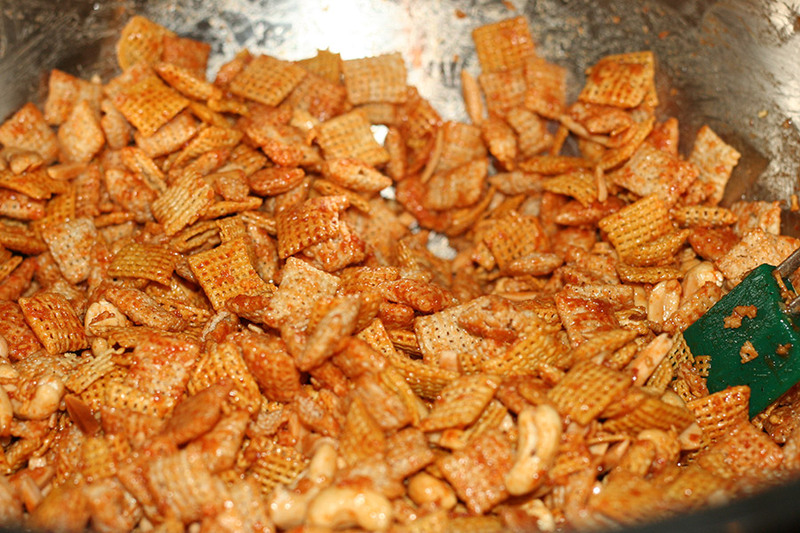 Stir the melted butter and sriracha mixture in to the cereal mixture and stir well, making sure that all nuts and cereal pieces are coated well. Transfer to rimmed baking sheets. Bake in the oven for an hour, stirring every 15 minutes. I’ve had a jar of tahini sitting in my pantry for too long. I really should use it more often. My intention when I bought it was to use it in salad dressings and similar sauces, but I just haven’t reached for it until now. I actually never intended to use it in this dish, but it just happened, and I’m glad it did. I got a couple of bunches of broccoli rabe greens in my CSA and I wanted to include it in dinner. I also had a head of cauliflower begging to be used. Both of these veggies tend to get used as side dishes. I wanted to include both in my main course. So I came up with this soba noodle dish. I love cooking with soba noodles. I buy a gluten free version and they cook up so fast and taste excellent. Boil some salted water in a pot and cook the soba according to the directions on the package. Drain and rinse with cold water to stop the cooking process. Mix the tamari and the sesame oil. Mix in to the cubed tofu. 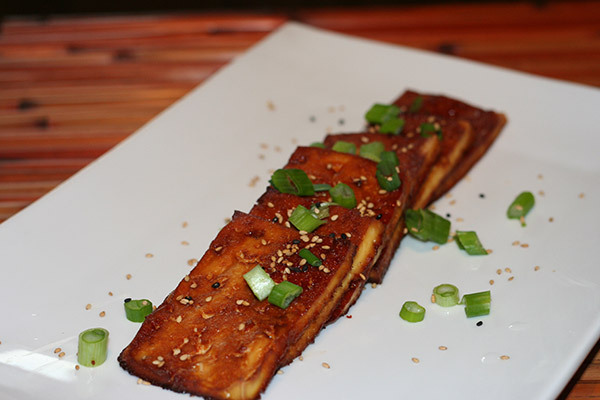 Place the tofu on a baking sheet and bake in the preheated oven for about 20 minutes. Heat up the coconut oil in a large pan. Add in the sesame oil. Saute the onion, garlic, ginger and shallots for a few minutes to soften. Break up the cauliflower and add to the pan. Cook for about 8-10 minutes. Let the cauliflower brown a bit. One the cauliflower is softer, but still has some bite to it, turn the heat down lower add in the chopped greens. Add in the red pepper flakes, salt and ground pepper. In a separate bowl, whisk all of the sauce ingredients together. To serve, layer the soba noodles then the cauliflower mixture. Then pour the sauce over both. You can garnish with scallions, roasted sesame seeds and additional red pepper flakes if you like. 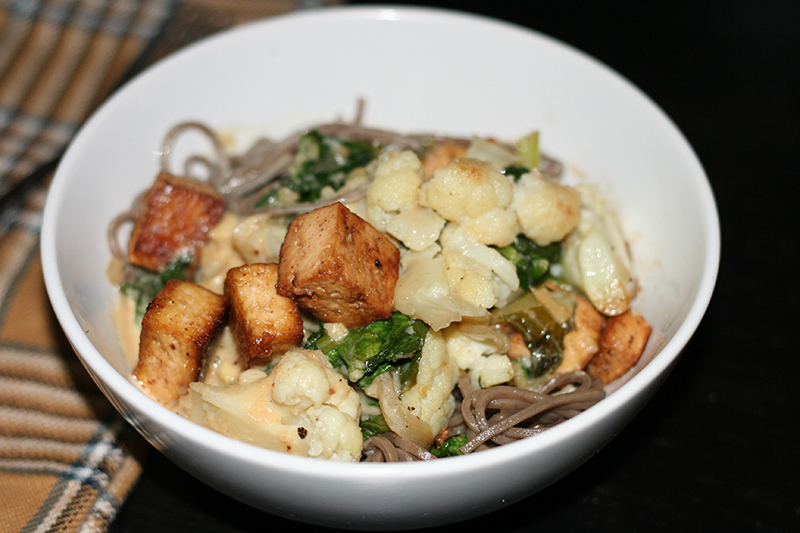 This tofu dish was actually inspired by some chicken I prepared for my family. The other night, I set aside some chicken wings from the batch I was using for chicken soup. I had plenty for the soup and figured that if I baked them, they’d be perfect for my husband as an appetizer of sorts. As I looked in the fridge for seasoning ideas, I eyed the bottle of sriracha sitting in the door. I eyed a few other potential ingredients, and settled on this sweet and spicy sauce mixture. While I was mixing it up, I had to dip a pinky in to test the sauce. Perfection! I needed to make it again. I knew that this sauce would be perfect for baked tofu – something I often make for myself and I’m always looking for new ways to flavor simple tofu. So, I set out to do just that on Friday. As I took the tofu out of the oven, I had a little nibble, and was so thrilled that I chose to adapt the sauce mixture for tofu. It is a perfect lunch or dinner treat and fantastic when served over rice. Drain the block of tofu. Cut the tofu in to around 6-8 pieces. I sliced the tofu block in thirds crosswise and then sliced each of those pieces in thirds. Lay the pieces on a baking sheet. Mix up the rest of the ingredients, except for the scallions and sesame seeds, in a small bowl. Brush the sauce mixture over the tofu, distributing it evenly. Let the tofu marinate for around 20-30 minutes. Bake in the oven for 10 minutes. Flip the pieces over and bake for another 10 minutes. Garnish with chopped scallions and sesame seeds.